Panhandle, TX is a very small rural town of about 2,500 residents located at the intersection of Highway 60 and Highway 207 around 28 miles Northeast of Amarillo. Panhandle is an easy commute to Amarillo on Highway 60, and we like the fact you don’t have to worry about traffic jams and can get to Amarillo in less than half an hour. Another thing we like about Panhandle is housing will cost you 20% less than the state average. You can find homes for around $98,000 and apartments around $1100. The majority of residents in Panhandle are families and homeowners, and the area is considered safe with good schools. The job market and stable economy are other good features. Panhandle has a lower unemployment rate than the state or the country. In Panhandle, like most of this area of Texas, the oil industry is a major employer. You can still find jobs in this industry as well as in ranching and manufacturing. Farming plays a role in the area’s economy, but concerns about water keep it to a minimum. When we're in Panhandle and want to enjoy a good meal, we can head to Carol’s Drive In on Elsie Avenue or to the Conway Inn and Restaurant on Highway 40. 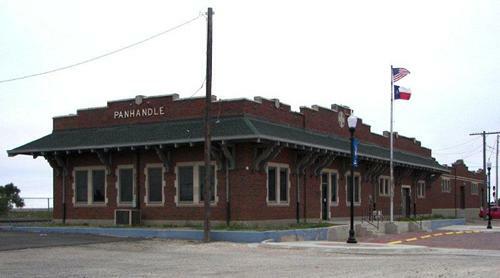 For more variety, Amarillo is a short drive and has many restaurants to choose from. Panhandle’s job market, low cost of living and location make it a good place to live and work, and one of our favorite small communities in the area.